About as imaginative as its title! Often on live albums one is able to find better versions of songs compared to their original studio counterparts. Sometimes songs simply gain new life when performed in front of an audience. This is the case with Barclay James Harvest's first live album, simply titled Barclay James Harvest Live. With this second live album, however, it is really the other way around! 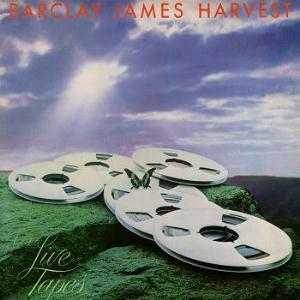 Live Tapes was my first exposure to Barclay James Harvest. I sometimes start my investigations into a new band with a live album of the band in question since that is often a good way to get an overview of the bands repertoire. I used to like Live Tapes and initially I rated it three stars. But since then I have acquired all of the studio albums from which these songs originally were recorded and I have discovered that the studio versions of most of these songs are superior to the Live Tapes versions in almost every way. The performances here come off as a bit lifeless and even more sleepy compared to the studio versions. There are a few moments of greatness, but they are far between. Also, they have not chosen their best songs from this period. There are some quite boring and unimaginative selections here. Live Tapes is still a half-decent live album, but it deserves no more than the two stars I have now given it. I now wish that I had started my investigations into Barclay James Harvest with a different album. Get the first live album instead, Live Tapes is only for fans and collectors of this band.